What does PEFC stands for? 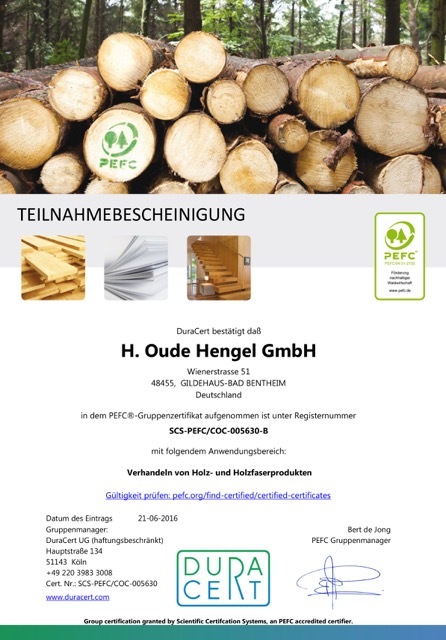 H. Oude Hengel GmbH is a wood trading firm with its own sawmill and drying plant. For over 100 years and now run by the fourth generation, a large assortment of wood products is supplied with pride to various target groups. We have ample facilities at our premises in Gildehaus (D) where the wood can be dried, stored, processed and sawed. H. Oude Hengel GmbH and her partners operate with respect for the environment. Therefore, our objective is to only sell proven legal wood. We take a critical look at our suppliers and the origin of the purchased wood. 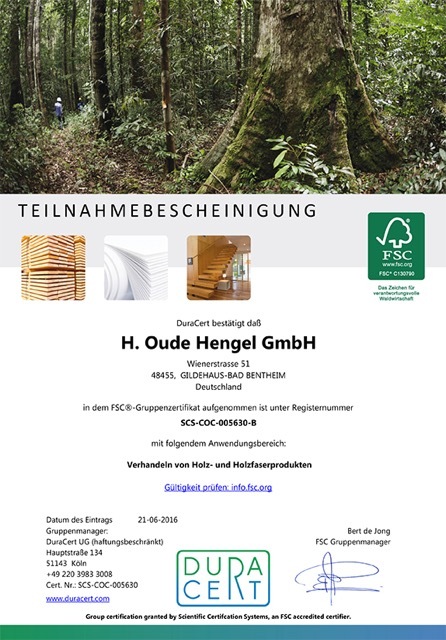 If possible, H. Oude Hengel GmbH will use certified wood as much as possible. There are various certificates that are used to prove that responsible wood is being used. H. Oude Hengel GmbH supports these certifications. At European level one is started to formulate a legislation against illegal wood chopping and the export of illegal wood. This is expressed in FLEGT. For more information on responsible wood please contact us.